This month’s Designbox speakers are Jedidiah Gant and Elisa Huber from the College of Design at NC State, speaking on the topic of impermanence as it relates to design, art, culture, and our interaction with objects. They’ll share lessons from Volume 37 of The Student Publication, one of the oldest student-led design journals in the country. Celebrate the history of The Student Publication, one of the oldest student-led design journals in the country. Started in 1950 as a tribute to Matthew Nowicki, a professor who made a lasting impact on the College of Design, The Student Publication has tackled such themes as structure, form, community and relevance in its 60 plus years. Including such significant contributors as Richard Saul Wurman, Bruce Sterling, Mies Van Der Rohe and Buckminister Fuller, The Student Publication has shaped design education and practices both locally and internationally. 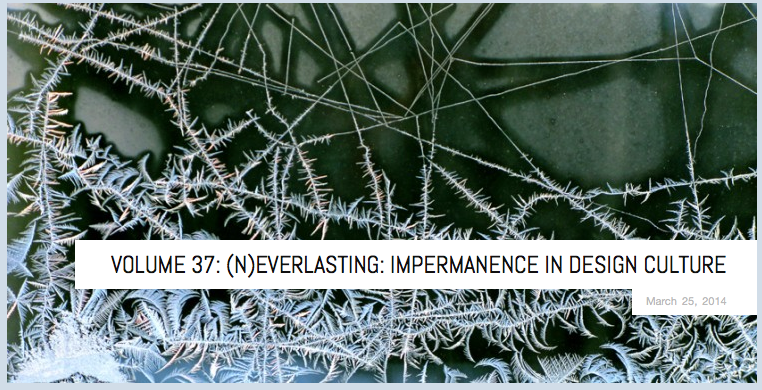 In Volume 37, we are looking to engage a discussion on the impact of impermanence as it relates to design, art, culture, and our interaction with objects. While the notion of impermanence in design culture is not a new one, the increasing pervasiveness of the ephemeral in our world begs for an updated evaluation.